We offer a wide range of activities - some year round, and we deliver more watersports in our summer season between Easter and October. Whatever the activity, it will be challenging and adventurous - both to the individual and the group. We encourage all groups to have a big day out - sometimes less is more, and a 'slower burn' day where the group have to work together to achieve a common goal is more memorable. A day out in the hills, forest or woods can be enhanced by paddling to the hill, exploring a local cave passage, or simply by walking to the woods. All activities are chosen in consultation with you to match agreed learning outcomes. 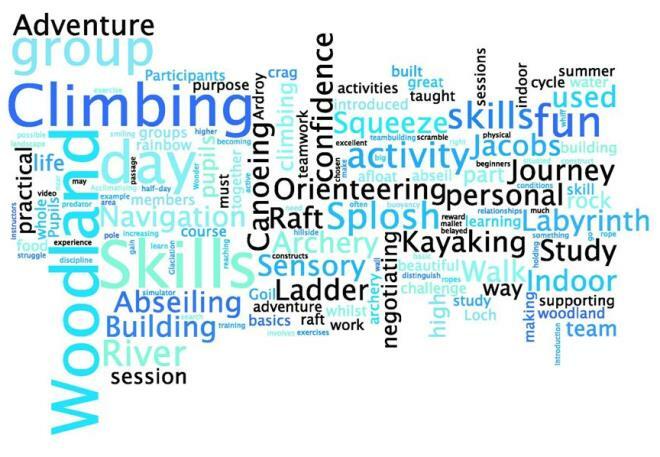 We've summarised all the activities we offer into a pdf document which can be downloaded here, or by clicking on the 'wordle' below.